Jolla's Gallery handles not only the images, but the videos and Ambience themes as well. It follows the general design guidelines and is a pretty simple affair. Upon opening the app you get a list albums - Photos, Videos and Ambiences. Photos is the actual image gallery. It is a scrollable list of thumbnails (15 per page), which you can tap to bring to fullscreen. There is no kind of filtering, not is there separation by date or location. The Sailfish gallery retains the MeeGo's looks completely. The only things you can do are select and delete images. Luckily there is Select All option. Images are displayed in full resolution and you can use only pinch gestures for zoom in and out. If you tap again on the image you'll get additional settings for sharing via Bluetooth, Email or social networks (Facebook, Twitter, Google,). While you are in this view mode you can use the swipe down gesture to bring the advanced menu. There you can view picture details, use the picture to create a new Ambience, delete it or get editing options (crop, rotate). Now, let's talk Ambiences. The Ambience menu, just like the gallery, is a scrollable list of Ambience thumbnails. Here you can set favorite Ambiences (which will appear on the Ambiences quick selection screen), change the ringtone volume of the default Ambiences, set or remove Ambiences. If you have created a custom Ambience, once you set it as a favorite, in addition to the ringtone volume, you will be able to assign custom ringtones for calls, messages, chats, emails, calendar evens and alarms. You can create a new Ambience by opening an image from Photos and select the appropriate option from the advanced menu. Jolla doesn't have a dedicated video player, the Gallery handles the videos instead. The Video sections has the same simplistic view as Photos - it is another scrollable list of static thumbnails (maximum 15 per page). The video player offers sharing of your videos, in much the same ways as the image gallery. It will even compress the videos for you. The video interface is really simple - you get just an auto-hiding scrubber at the bottom of the video. Tapping on the center pauses the video and it is the only way to actually use the scrubber. Tapping on either of the sides brings additional options for sharing via Bluetooth, Email, Facebook, Twitter and Google. Finally, if you swipe down the advanced menu will pop up with Delete and View Details options. The integrated video player supports only MP4, MOV and MKV files up to 1080p resolution. DivX and XviD video codecs are not supported, neither is AC3 audio. The lack of those three means the video player is rather useless, unless you don't plan of doing lots of converting. 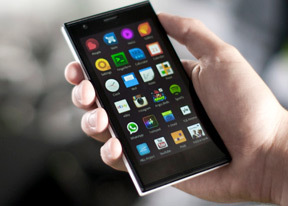 We really hope Jolla addresses that with future updates. And while at it - subtitle support would be nice too. The final bit of the Jolla's multimedia package is the nicely looking music player called Media. Its main screen holds Playlists, All Songs, Albums and Artists section shortcuts. Those sections are pretty much self-explanatory. There is no Now Playing screen. Once you select a song, a pop-up will appear at the bottom of the screen housing the scrubber and the music controls. Below the music controls is the name of the now playing song, plus part of the names of the previous and next songs. You can swipe between those just like you would use the dedicated virtual keys. You can swipe up this pop-up to reveal the hidden Add to Playlist, Shuffle and Repeat options. Unfortunately, the Jolla music player offers no equalizers, or the option to repeat a single song.